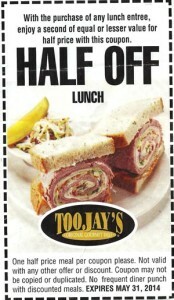 Check your mailboxes, because you should be getting the amazing Half off Lunch Coupon from Toojays. Your favorite Deli just keeps getting better, with amazing prices, fresh food and friendly service, you can’t complain. Plus, use this new coupon to save 50% off your next lunch meal. You literally get one half price meal per coupon with the purchase of any lunch entree. Bam! life is great when you use Toojays Coupons. See for yourself. Expect to see this same coupon listed here.